The sun is shining, the birds are singing, and everyone has a spring in their step which can only mean one thing: winter is finally over! And, with the end of winter comes the start of the new caravan season. You can now bring your caravan out of its winter hibernation and begin to plan all of your future getaways. However, before you go gallivanting across the country, it’s important to make all the right checks and thoroughly prepare your caravan for the new season. After spending so much time out of use and sitting in storage, there are some things that might not be quite up to scratch. 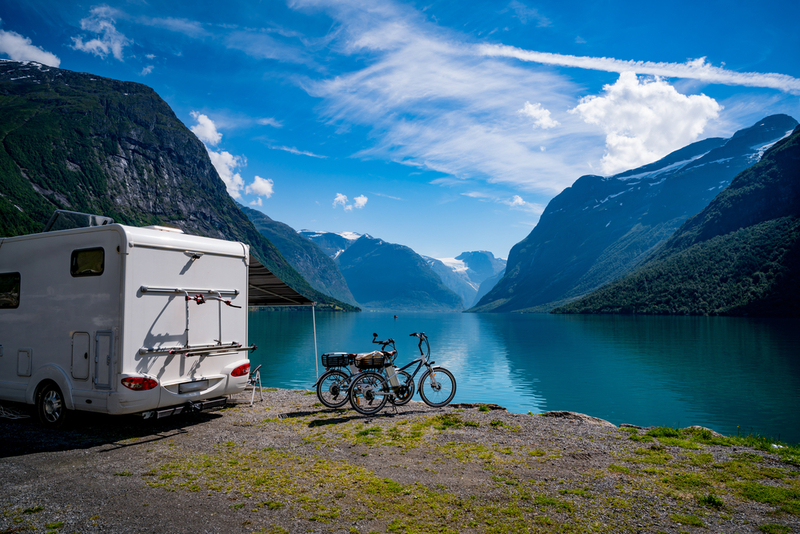 With that in mind, we’ve taken a look at some of the most important steps you need to take in order to prepare your caravan for the upcoming season. After sitting in storage and not being used for the duration of winter, it’s more than likely that your caravan will have a bit of a musty smell. Although this can be easily rectified by airing out the caravan, it’s important to check that this smell isn’t coming from an underlying problem of damp. Even though you might take all of the precautions to protect your caravan from the elements, the cold and the wet can cause havoc with your camper. When check for damp, your nose will probably guide you in the right direction! Air out your caravan thoroughly for a day before inspecting the interior, paying special attention to any soft furnishings that might need replacing. It’s also important to check doors and windows for any broken seals that could be causing leaks and replacing these if necessary. This handy video gives you more tips for checking for damp. Another vital check to make is the state of the tyres on the caravan, as standing still while bearing the brunt of the weight of the vehicle can really take its toll, which could endanger your safety. As you would with a car tyre, you need to check for any bulging, cracking, or wear on the tread, as well as inflating the tyres to the manufacturer’s pressure if necessary. If you have replaced your road tyres for winter tyres, you’ll need to refit the road tyres while checking them for any sign of wear. Once your tyres have been fitted, you’ll need to check that your wheel bolts have been properly fastened. This post by Caravan Guard gives you more information on looking after your caravan tyres. Before you set off on any trips, you’ll also need to prepare your water tanks as it’s likely you’ll have drained them prior to winter storage. First, you’ll need to test the whole water system by reconnecting the pipes, filling the tank with water and running it through, in order to check for leaks. If any pipes are broken or the tank has a leak, you’ll need to replace them before repeating the process. It’s then important to sterilise the tanks, as winter hibernation will leave them with a musty smell and taste, which you can do by filling the tank with a sterilising solution and leaving it for up to twelve hours. Finally, once you’ve flushed the tanks with clean water after sterilisation, you can replace the water filter and you’re good to go! For a more detailed explanation of preparing your water tanks, check out this post by the Caravan Club. As part of your winter storage, you should have also disconnected your battery, which will need to be reconnected in preparation for the new season. Firstly, you’ll need to clean all the caravan leads and battery terminals with a contact cleaner, before following the manufacturer’s instruction on reconnecting the battery. Once it’s been reconnected, check the battery is working by turning on the interior lights and water pump. It’s also a good idea to keep your battery charged throughout winter, but if you haven’t, you’ll need to pop it on to charge for a few days. This post by Go Caravanning offers more information on taking care of your caravan’s leisure battery. In order to stay safe while on your trips away, it’s important to check all of the security and safety equipment as part of your preparation for the season. Check that the locks and alarms are still in working order and that the alarm siren is still audible, replacing any that don’t work. It’s also a good idea to check your tracking device if you have one, by moving your caravan a few miles away from the normal storage space and seeing if you can still track it. You’ll also need to check your wheel clamp and hitch lock for any wear and tear, and that they can be fitted and removed easily. In terms of safety equipment, it’s important to check that your smoke alarms are in working order, that you have a fully stocked first aid kit, and that your fire extinguisher is in date. If you don’t have a fire blanket, it might also be worth investing in one. Your road lights are extremely important for the safety of yourself and other road users, so it’s important to check that they’re fully working. Inspect the plug for any cracks in the housing or broken or corroded pins, before connecting the caravan to the car. Once it’s connected, have someone check each light before inspecting lenses and marker lights for any cracks or missing screws. For more information on checking for any faults with your lighting, this post offers a helpful guide. It’s also a good idea to do a bit of a spring clean to get your caravan in tip top shape. Spend some time washing and polishing the exterior and interior, paying special attention to windows, vents and electrical appliances like the fridge, as well as oiling all of the hinges. All of this will help to freshen up the caravan and get it ready for use. Finally, it’s also worth considering a professional service which can inspect some of the more technical elements that might have issues after a winter hibernation, such as the electrical system, body work, and water systems. For more information on your preparation checklist, check out this post, which will have you on the road in no time! And, if you’re planning your next trip away, why not check out our holiday parks here at Pure Leisure?